Contact Tennessee Injury Lawyers The Law Offices of John Day, P.C. Pedestrians must follow all traffic-control devices and pedestrian control signals. In the absence of a working traffic-control signal, drivers must yield the right-of-way to pedestrians crossing the road within a crosswalk. Pedestrians must not run into the road or the path of any vehicle when the vehicle is so close that the driver could not stop. 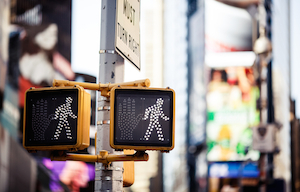 When a pedestrian crosses a street in any place other than a marked crosswalk, the pedestrian must yield the right-of-way to vehicles on the road. When a pedestrian is between two intersections with traffic-control signals, he or she is not allowed to cross the road except in a marked crosswalk. Pedestrians cannot cross intersections diagonally unless it is authorized by an official traffic-control device. If a sidewalk is present and usable, pedestrians are not allowed to walk on the roadway. If there is no usable sidewalk, pedestrians must walk on the shoulder as far as possible from the road. If there is no sidewalk or shoulder, pedestrians must walk on the outside edge of the road on the left side. Pedestrians must yield the right-of-way to emergency vehicles. Pedestrians cannot pass through, around, over or under any railroad crossing gate or barrier when it is closed or being opened/closed. Pedestrians must not cross the street within 10 feet of the front of a vehicle which has momentarily stopped to load or unload passengers. It is against the law for a pedestrian who is under the influence of alcohol or drugs such that he is a hazard to walk on a highway, except on a sidewalk. People who use motorized wheelchairs are subject to all the responsibilities and duties of pedestrians. Drivers must completely yield the right-of-way to any pedestrian using a white cane or being accompanied by a guide dog. Drivers must yield the right-of-way to pedestrians on a sidewalk. Drivers must use due care to avoid colliding with pedestrians and should use their horn if necessary. Drivers should be especially careful around pedestrians who are children or confused/incapacitated persons. If you have been injured as a pedestrian in Nashville or Davidson County, you may be entitled to compensation. Contact us so we can discuss your case and let you know whether we can help. We offer a free, no-obligation consultation with one of our award-winning lawyers and we handle all pedestrian accident cases on a contingency basis so we only get paid if we recover money for you. Call us at 615-742-4880 or toll-free at 866.812.8787. But, do not delay. The law only allows you a limited time to pursue your legal rights.